Loot Anime is the latest crate offering from the masterminds behind Loot Crate. Similar to their regular monthly Loot Crates, Loot Anime is a monthly mystery bundle packed with figures, collectibles, manga, apparel, accessories and other exclusives from popular anime and manga series revolving around a new theme every month! 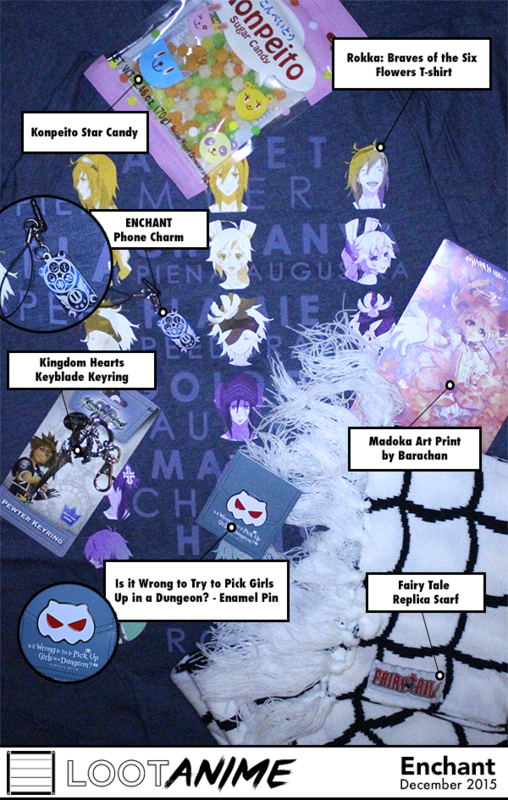 The December 2015 Loot Anime box was themed Enchant and featured items from Rokka: Braves of the Six Flowers, Kingdom Hearts, Fairy Tale, and Is it Wrong to Pick Up Girls in a Dungeon. Additionally, each box features an exclusive Phone Charm, candy and badass poster describing all the contents in the Loot Anime Enchant crate. Here’s what was in the Enchant box? Interested in becoming a member of the Loot Anime family? You can find out more about the anime crates on the official Loot Anime website. † Product was provided by Loot Crate for unboxing/review purposes. This post does not contain affiliate links. Plantronics RIG 500E Gaming Headset ReviewBombshell Reviewed!